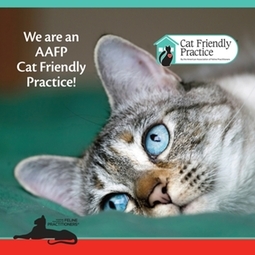 As of October 22, 2013 we are approved as a Cat Friendly Practice by the American Association of Feline Practitioners. One of the goals of the program is to create a more calming environment for our feline patients. Staff members have been trained on how to approach and handle cats in a gentle, empathetic and caring manner. The practice must meet a comprehensive checklist of performance criteria to verify that staff members are especially qualified and dedicated to making every visit as pleasant as possible and beneficial for you and your cat. Each Cat Friendly Practice has at least one designated "Feline Advocate" on staff. This is a knowledgeable professional who ensures that your cat's care is guided by feline-focused standards. By carefully advising you on unique feline needs in areas such as nutrition, routine check-ups, environmental enrichment, behavior and other essential issues, your skilled CFP team can help your cat to be healthy and happy.